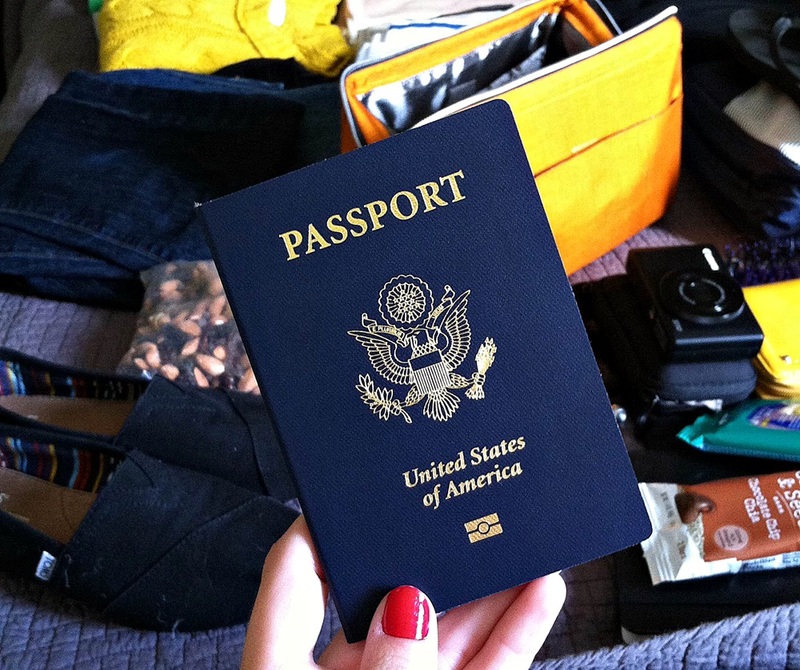 Sometime last spring I decided to stop whining about wanting to go on a “big trip” and booked something. From the moment I chose the beauty and history of Eastern Europe to the moment my flight was booked took about 12 hours. 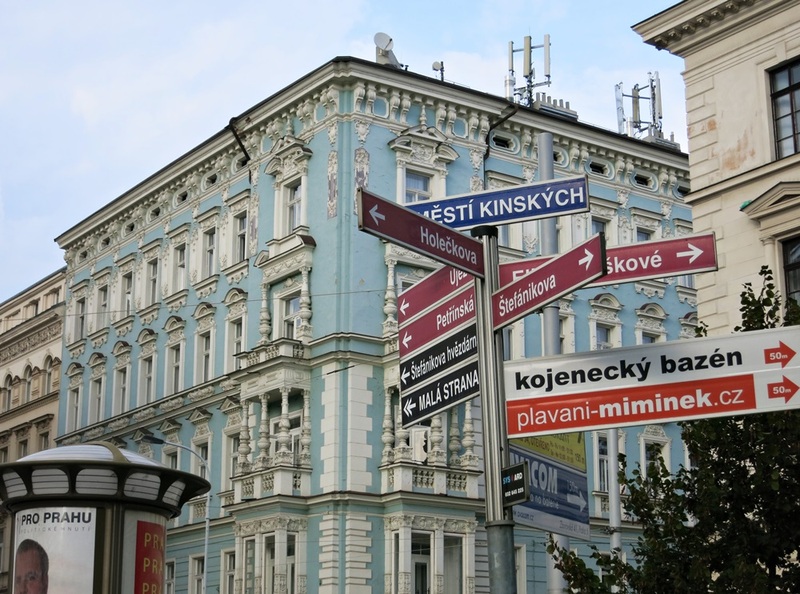 I knew I would have a few days alone in Prague, and then meet up with a tour group that would head east into Krakow, Poland and then down into Budapest, Hungary with plenty of stops along the way, but beyond that, planning was minimal. I bought a few books, because that’s part of the fun, but despite thorough readings and one active Pinterest board I just couldn’t make anything stick in my head. I’d find myself wondering “Which city has the baths again? Which one came out of WWII mostly unscathed? Which one serves a lot of pork knuckle?” (FYI – the answer to that last question is basically “All of them”) but I couldn’t connect the fact with the city. Finally, I just gave up and dedicated myself to assembling a monochromatic wardrobe and researching which pocket point-and-shoot camera to buy. FYI this ended up being a Canon Powershot S110 — ain’t no way I was going to lug a DSLR around for 2 weeks. When the day arrived, John drove me to the airport. He was staying behind to take care of Bones, and maybe — meaning definitely — golf and watch some football. At this point I have to say that it’s still such a pleasure to fly international and be treated like a valued customer, with non-stop food (hungry or not, you accept), real silverware, and complimentary wine. I felt like Uncle Frank in Home Alone. “Fill it up, please! It’s free, isn’t it?” Even in coach. 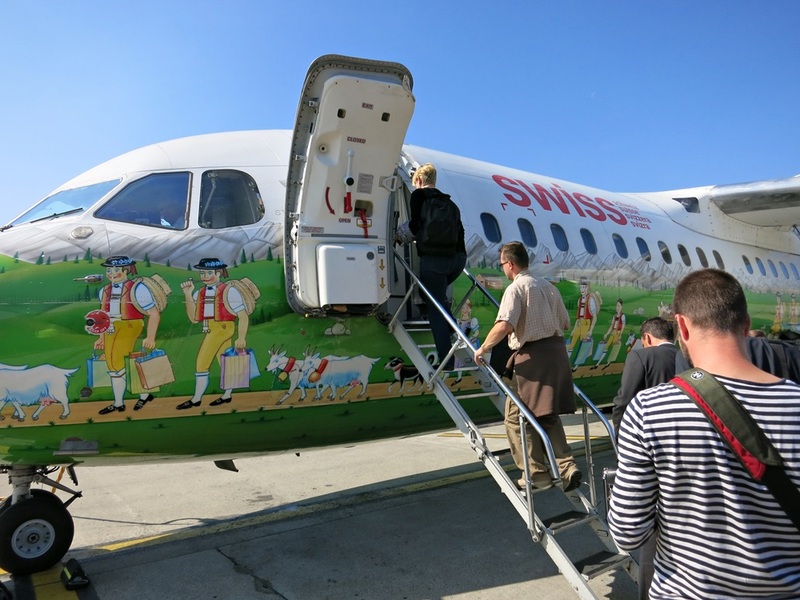 After a brief layover in Zurich (where I boarded the most adorable plane ever for the final leg) I finally arrived in Prague. I bought a 3-day pass for all modes of public transportation, then wrangled my suitcase onto a bus and frantically looked back and forth from my map to the signs outside until we got to the stop closest (I hoped) to my hotel. I like independent travel and consider myself very handy with a map, but when you can’t sound out the words in your head, it’s hard to identify them over a speaker on a bus. Words like Hradčany. Staroměstské náměstí. Vyšehrad. Oof. When it came to choosing a hotel, I let Rick Steves help me out. I like Rick — he keeps things simple, but sincere. 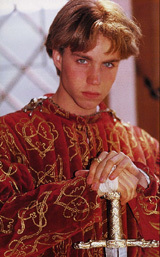 He recommended Hotel Julian, and I had no complaints. Thank you, Hotel Julian. Both the beauty of Prague and the complicated structure of its words was apparent just outside my hotel. Hello, baby blue building and hard to pronounce signs. 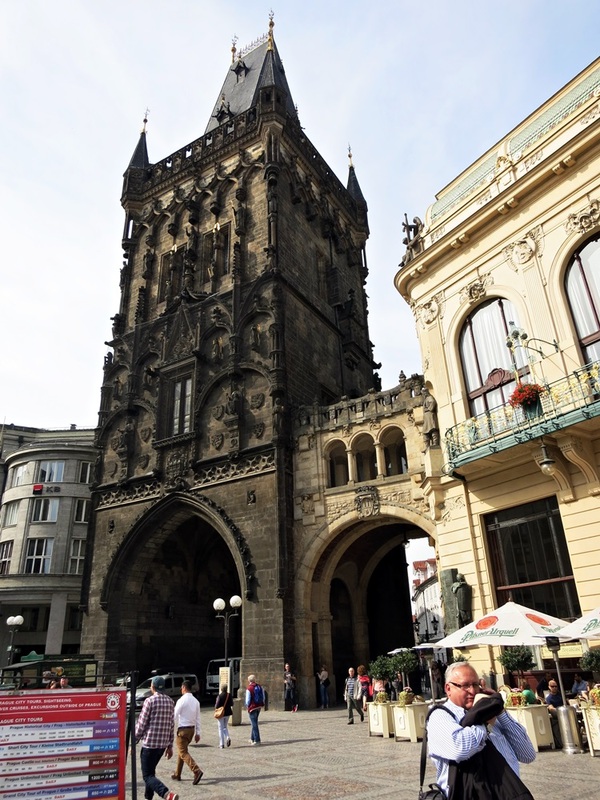 I spent 2.5 days in Prague, and rather than break it down itinerary-style, I’m just going to mash it all together in one out-of-order recap of my favorite stuff. Okay? Good. If you picture Prague like a square with the Vltava river down the middle, I was staying in the lower left corner. 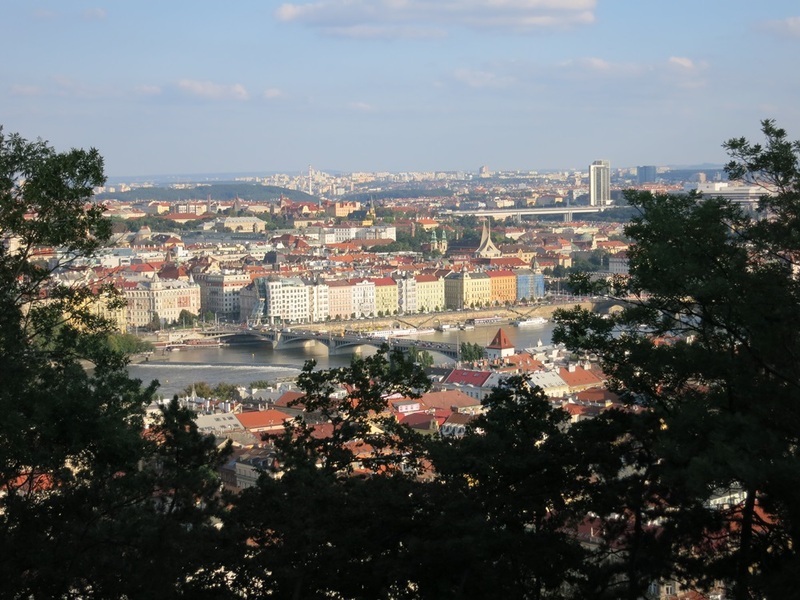 On that side is Hradcany (the Castle district) and Mala Strana (Lesser Town), which is where the “big park” is. 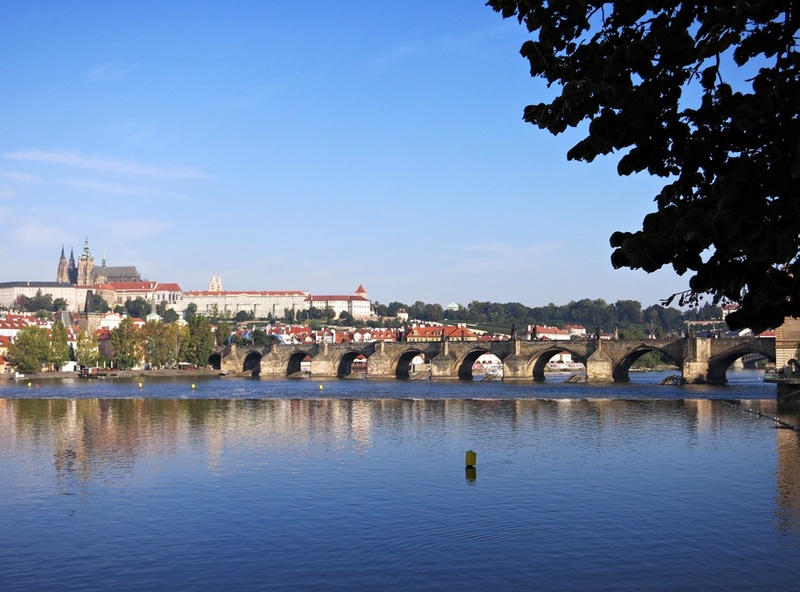 On the other side of the river are Josefov (the Jewish Quarter), Stare Mesto (Old Town tourist heaven), and Nove Mesto (New Town fancy shopping) areas. 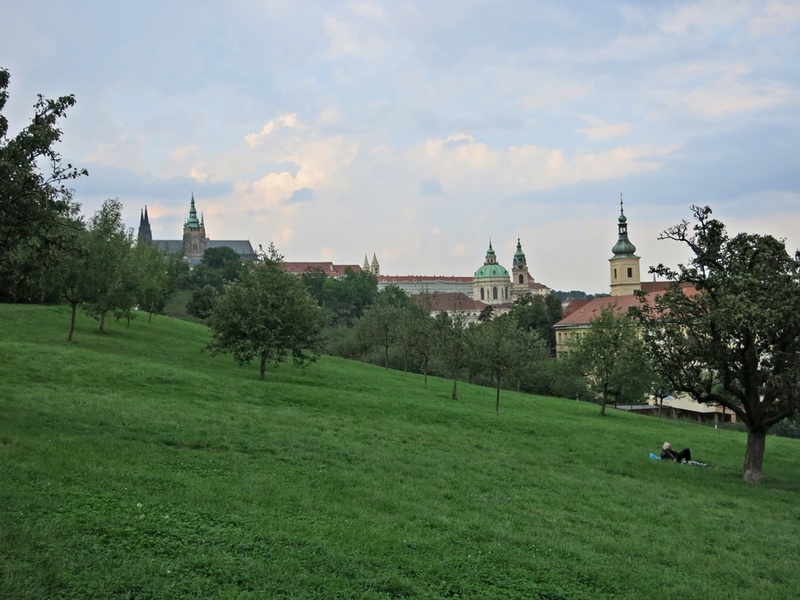 A short walk away way from my hotel was the “big park” I mentioned — Petrin hill, a sprawling park with criss-crossed paths, built-in stone staircases, fruit trees, rose gardens, a mirror maze, and even a restaurant about halfway up. You can hoof it or use your subway pass to ride the funicular cable car to the top. Petrin hill is for lovers. Trust me on this one. The view looking east from one Petrin hill’s many high-up benches. 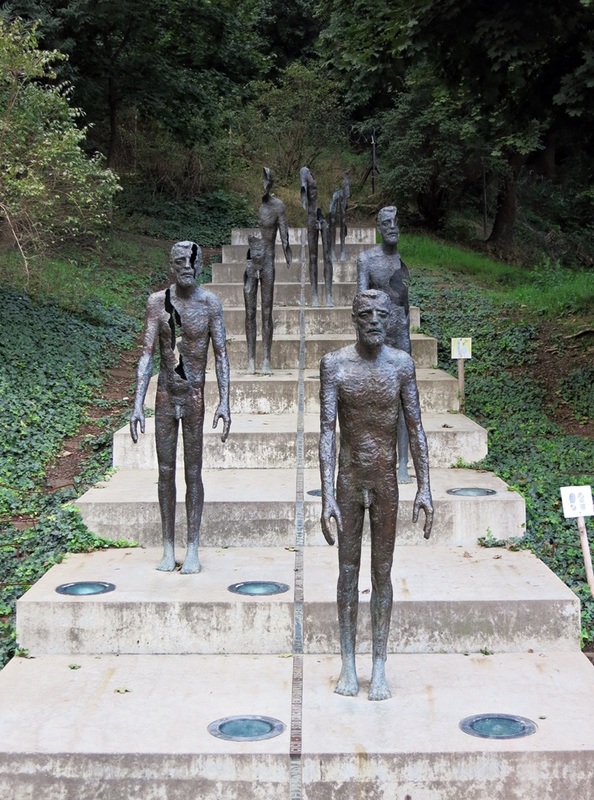 Memorial to the Victims of Communism. North of Petrin is the Prague Castle complex. 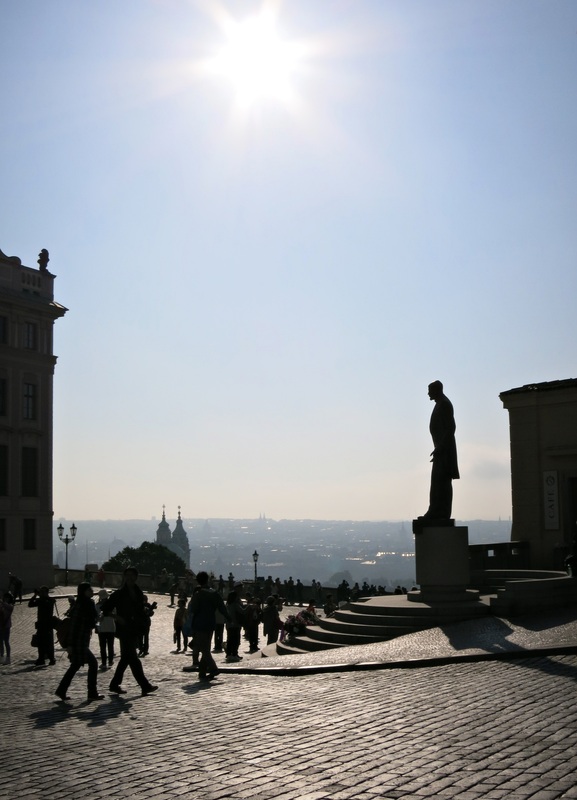 Outside the castle gates is a wonderful spot to take photos overlooking the city, and the “TGM” statue of Tomas Garrigue Masaryk — the first democratically elected president of the newly formed Czechoslovak Republic (independent of Austria) in 1918. Early morning view of the Tomas Garrigue Masaryk statue outside Prague Castle. 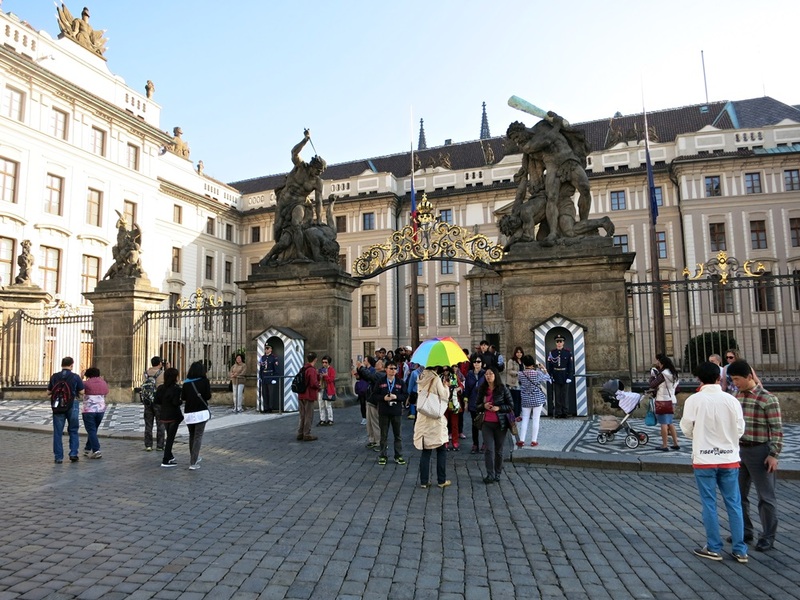 The castle gates aren’t as obviously grand as other European castles (although there are the token serious guards in the striped “houses”)…. But a few steps inside takes care of that. 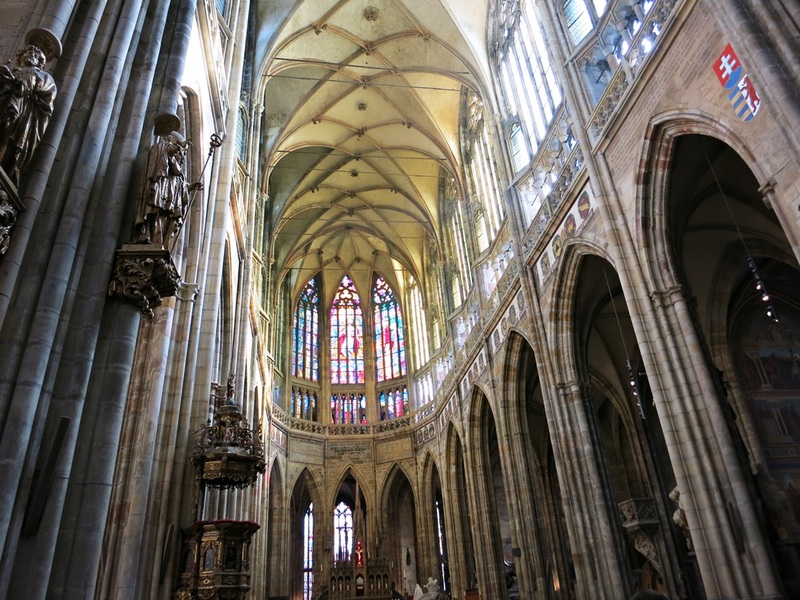 The Gothic St. Vitus cathedral took more than 500 years to complete (deaths and wars have a way of slowing things down), but today it’s resplendent. 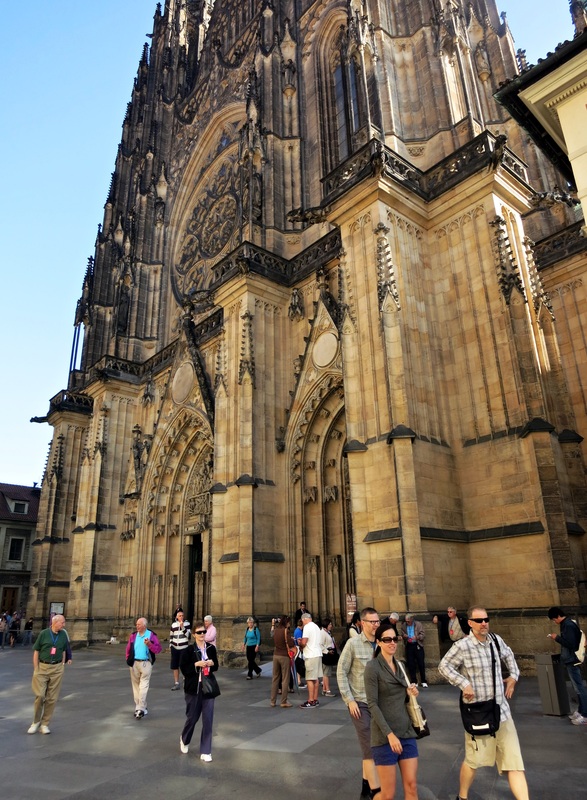 St. Vitus Cathedral is part of the Prague Castle complex. Inside the cathedral looking towards the altar. 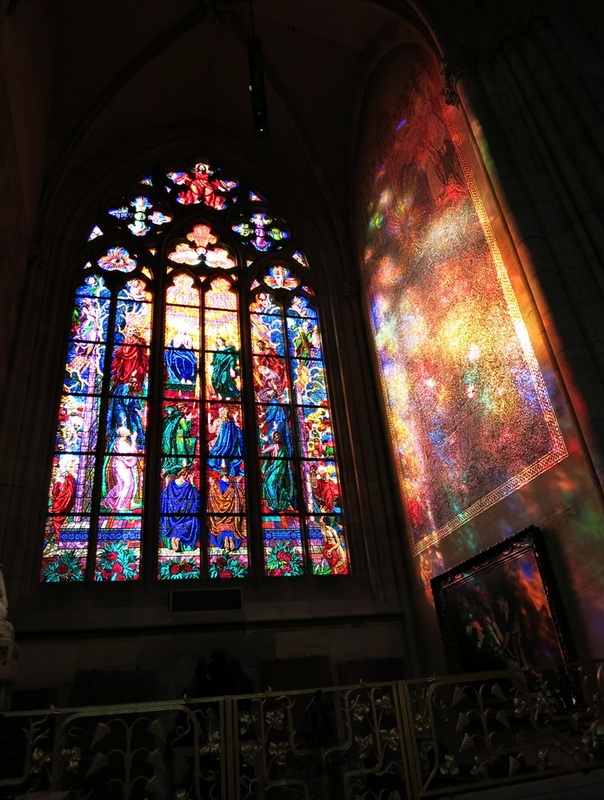 One of the many stained glass windows inside St. Vitus Cathedral. 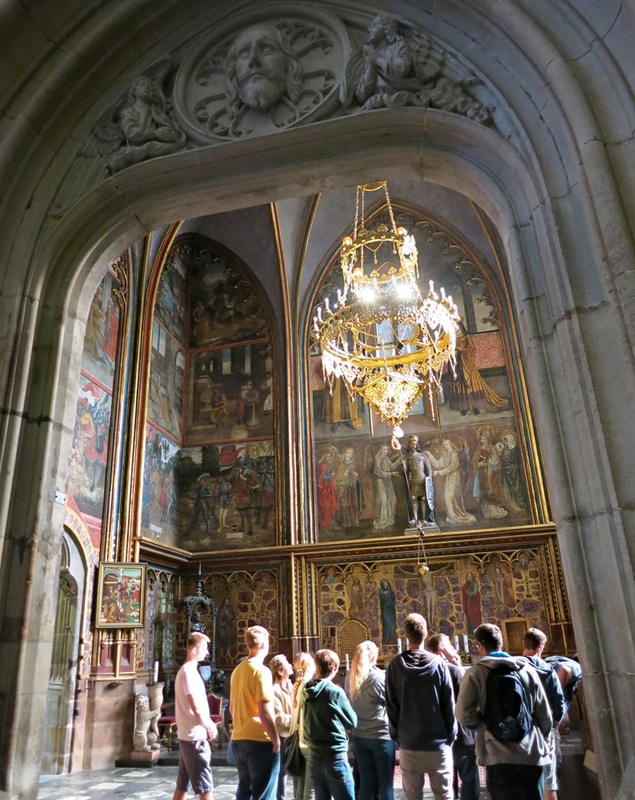 Inside the cathedral is the St. Wenceslas Chapel. Wenceslas is the patron saint of the Czech Republic, and the chapel was built over his tomb in St. Vitus sometime during the 14th century. It’s decorated with more than 1,300 semi-precious stones and has frescoes on the wall depicting scenes from the bible and St. Wenceslas’ life. The only thing I knew about Wenceslas was that he was the “good king” from the 1853 Christmas carol (also this), but it turns out that during his lifetime he was actually just a duke, and it was only after he was killed by his pagan brother Boleslav in 935 that Wenceslas was hailed as a Christian martyr and made both a king and saint. The St. Wenceslas Chapel, dedicated to the patron saint of the Czech Republic. There are other churches and attractions within the castle complex, but I loved this picture-taking spot the most after leaving St. Vitus. One of the many views from inside the castle complex. Southwest of the castle complex and part of Petrin Hill is Strahov Monastery. Founded in 1140, it houses the nation’s oldest books. 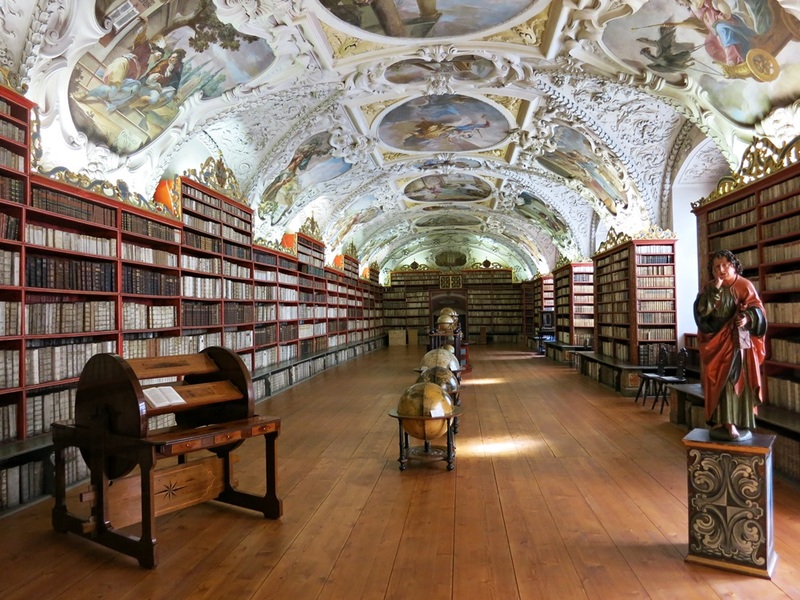 In all of the guidebooks I read on Prague there was at least one photo of the monastery’s gorgeous library rooms. The Philosophical Hall at Strahov Monastery. 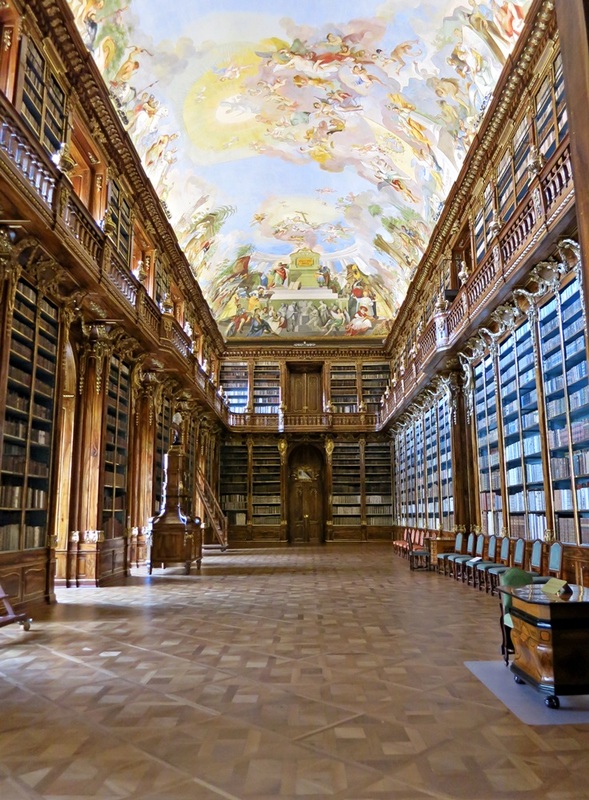 The Theological Hall at Strahov Monastery, completed in 1679. The statue is of St. John. Connecting the right and left bank over the Vltava river is Prague’s famous Charles Bridge. The site first held a wooden bridge until the 11th century, then the stone Judith Bridge until 1342, but both fell victim to floods. 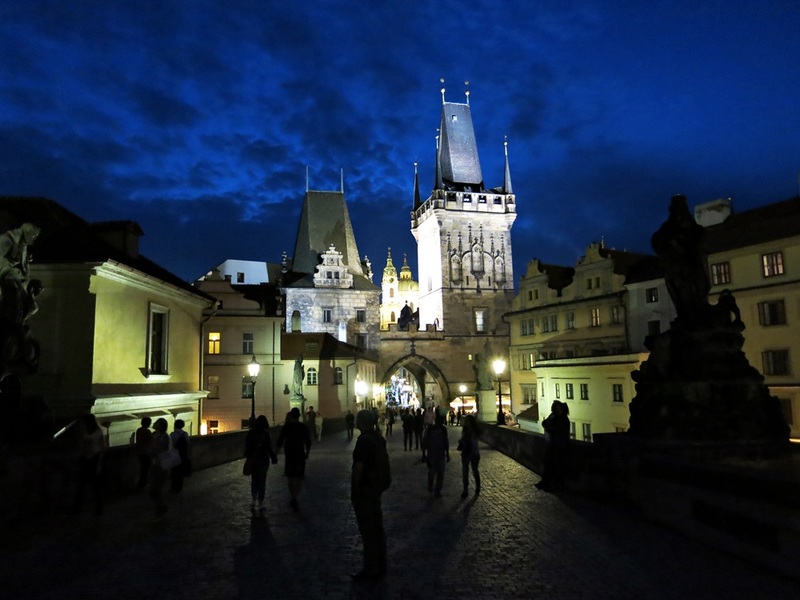 In 1357, construction of the current bridge began during the reign of Charles IV (hence the name), and it’s rumored that he was so obsessed with the details of the bridge’s construction that egg yolks were added to the mortar to help bind and strengthen it. Modern lab tests actually prove that the mortar contains both inorganic and organic ingredients, so maybe Charlie was onto something. Admiring Charles Bridge and the castle complex beyond from the right bank. View from Charles Bridge looking west toward the Lesser Town Bridge Towers. Here’s the same view from a bit further back at night. Beautiful evening light from Charles Bridge. Along the bridge (which was pedestrianized in 1950) are 30 statues, although most of them are actually copies — the originals have been safely moved inside to protect them from the elements. Copy or not, the oldest is this one from 1683 of St. John of Nepomunk. A priest in the court of King Wenceslas IV, he was thrown from the bridge and drowned in 1393 for not telling the king the queen’s confessions. Tough gig. Touching the falling priest on his statue is said to bring good fortune and to ensure you’ll return to Prague, but most people apparently prefer to touch the dog on the left or the queen on the right, as you can see by how shiny they’ve been rubbed. I decided to just touch all 3, then liberally bathe my hands in sanitizer. So did this woman (minus the sanitizer) and 10 of her friends that waited behind the cameraman to take their turn at a snail’s pace. 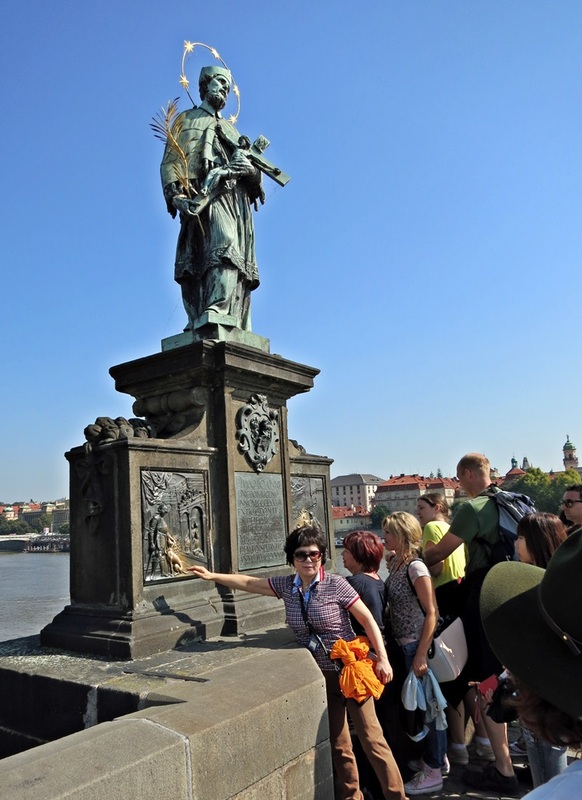 Statue of St. John of Nepomuk on Charles Bridge — don’t forget to rub it for luck! 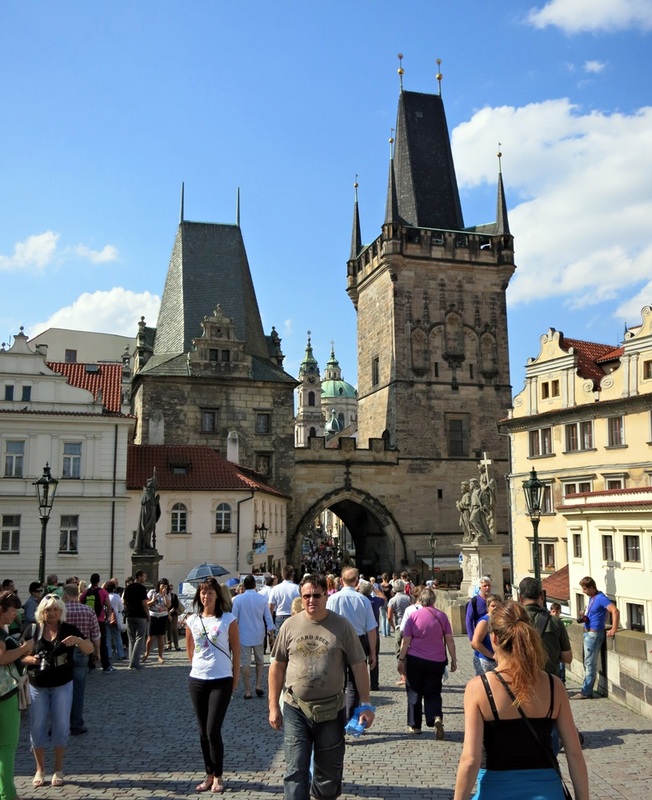 On the other side of Charles Bridge is Old Town Square. The spot has been a market since the Middle Ages, and today it’s a classic gathering place for tourists and street performers, with beautiful architecture, dozens of restaurants and cafes with outdoor seating, and carts selling sausages, ham, beer, crepes, and halusky (potato with cabbage and bacon). 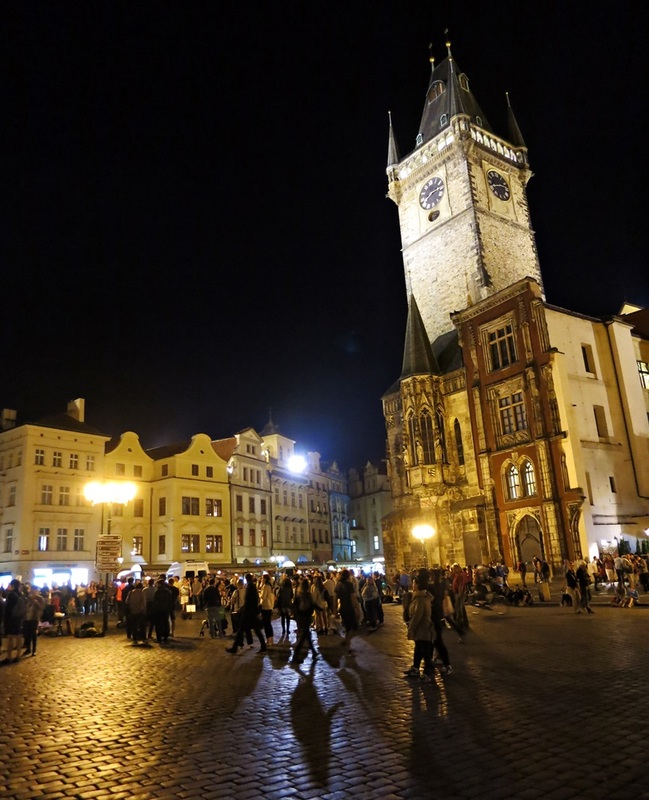 Bustling Old Town Square in Prague — pork knuckles and street performers at every turn. Old Town Square at night. I took the evening photo on my last night in Prague, and as I sat on a bench with a beer, feeling a bit disappointed that I hadn’t made time for the opera or a classical music concert during my stay, a guy showed up, set up a keyboard, and started playing the Chariots of Fire theme. Hello, feelings! It was everything I could have asked for. 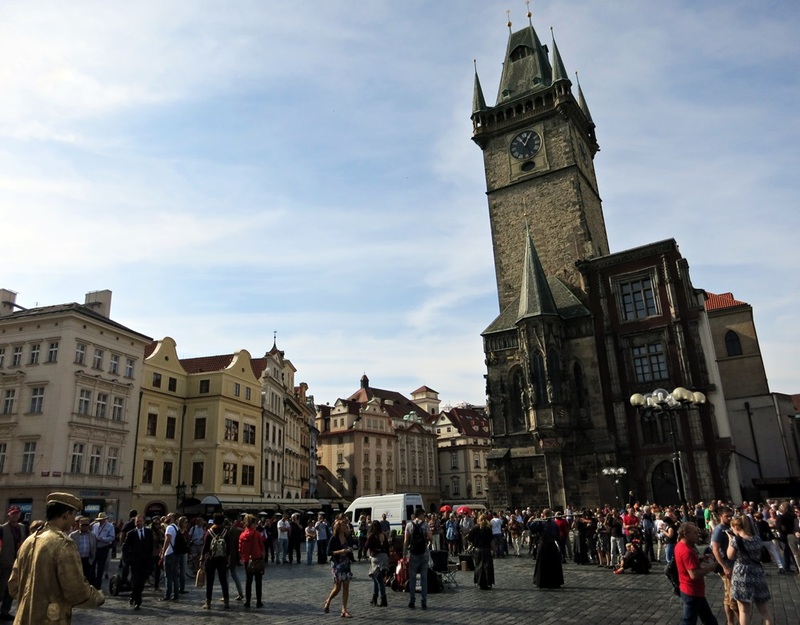 As the hour draws near, most of the tourists in Prague flock like zombies to the 15th century Astronomical Clock built into one side of the Old Town Hall Tower. Each hour, a procession of wooden apostle statues move between the two little doors at the top of the clock while the skeleton of death tolls the bell, and hundreds of tourists raise cameras, phones, and enormous iPads (a personal pet peeve of mine — why are you carrying that huge thing around as your camera?) to capture it. Tourist-show or not, the clock is impressive — it’s the third-oldest astronomical clock in the world and the oldest one still working. 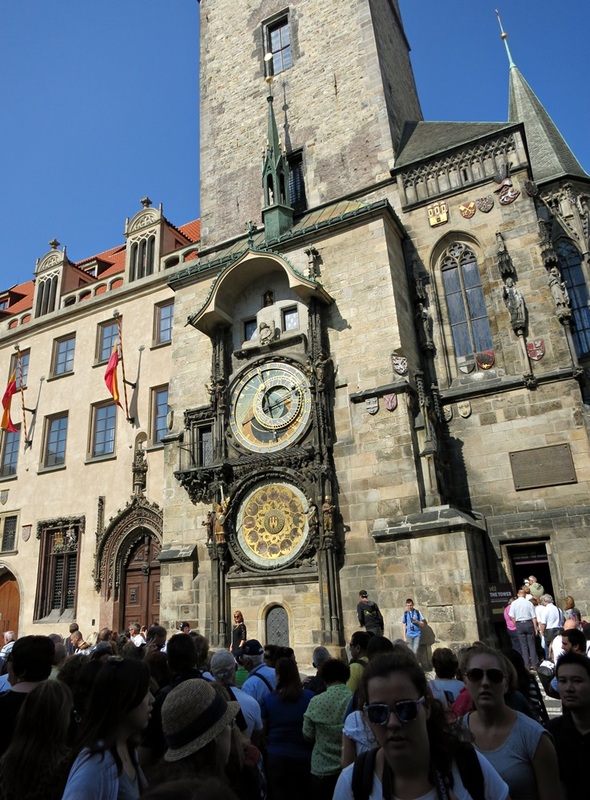 The Prague astronomical clock is the third-oldest astronomical clock in the world and the oldest one still working. 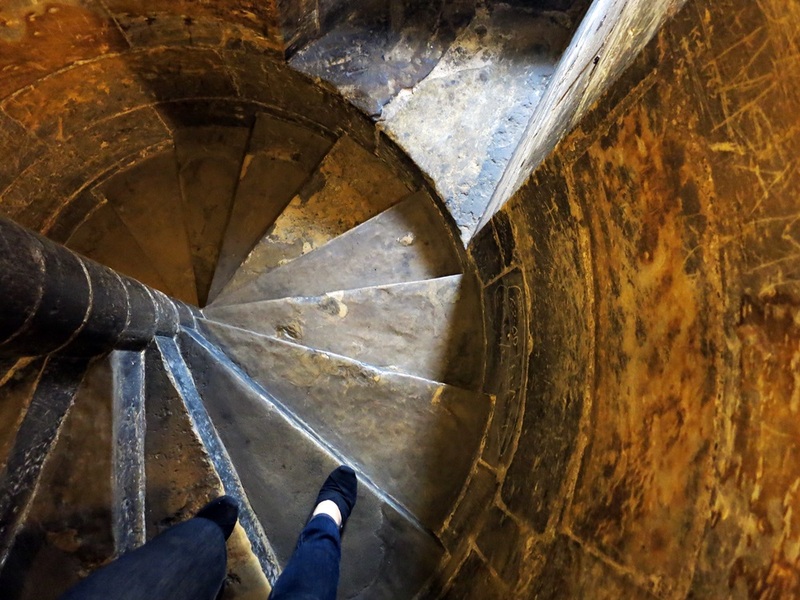 Also nearby is Powder Tower, a 213-foot tall stone Gothic tower built in 1475, and I decided to climb it. Powder Tower gets its name from the gunpowder it stored in the seventeenth century. Getting to the top required a few pauses (I am so, so out of shape), but it was worth it. Careful single-file stepping at Powder Tower. The open-air views were magnificent, and a little scary, since there were no barriers to keep visitors from hoisting themselves up and over the window ledge, but the fresh air and long views were fantastic. 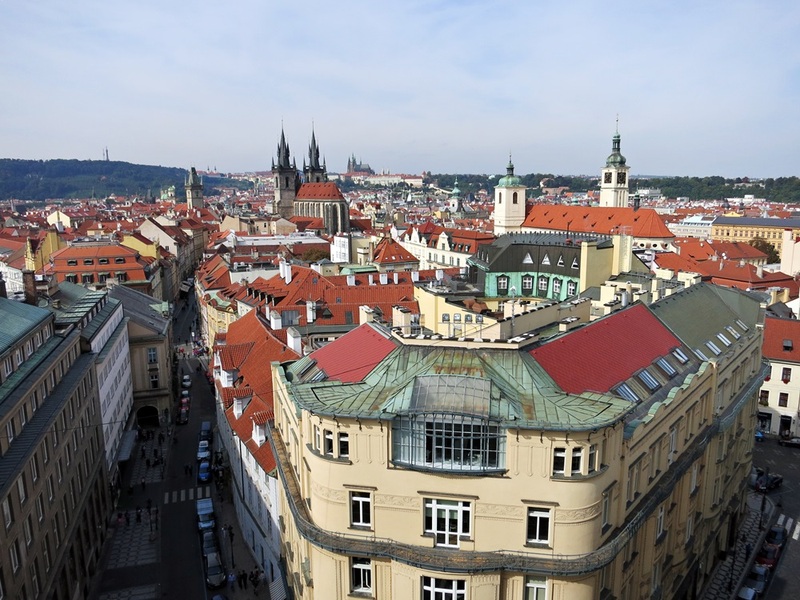 I love the way the Prague skyline is a collection of red roofs, green domes, and pointed spires. View from Powder Tower looking west towards the double spires of Church of Our Lady before Tyn and Prague Castle across the river. North of the Old Town Square is Josefov, the Jewish Quarter of Prague. Visiting the Jewish neighborhoods and memorials throughout my trip was something that meant a great deal to me, for reasons I am sure most of you can relate to. As a student of history and, more importantly, a human being, I wanted to walk those streets and honor the memory of those who lived there. Often times these visits were the saddest moments of the day, but also the most memorable. 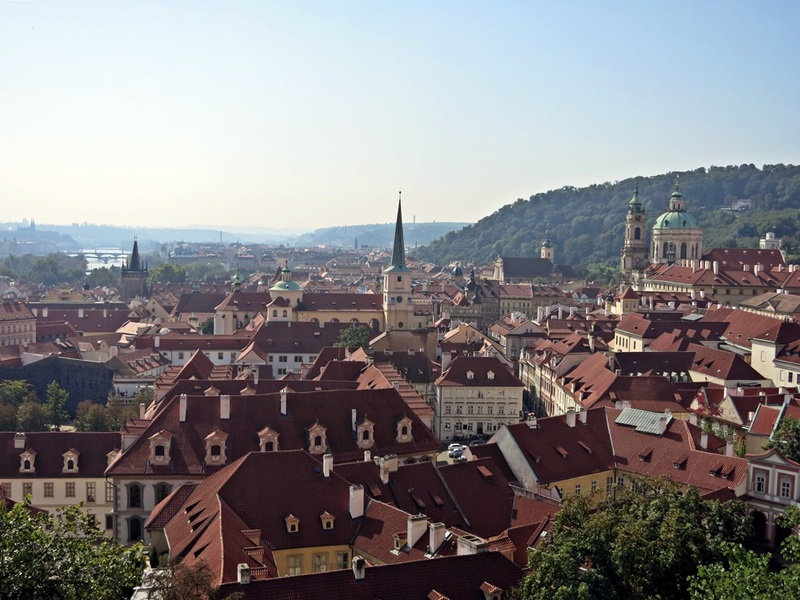 The Jewish Quarter in Prague dates from the 13th century, and has a long and difficult history. 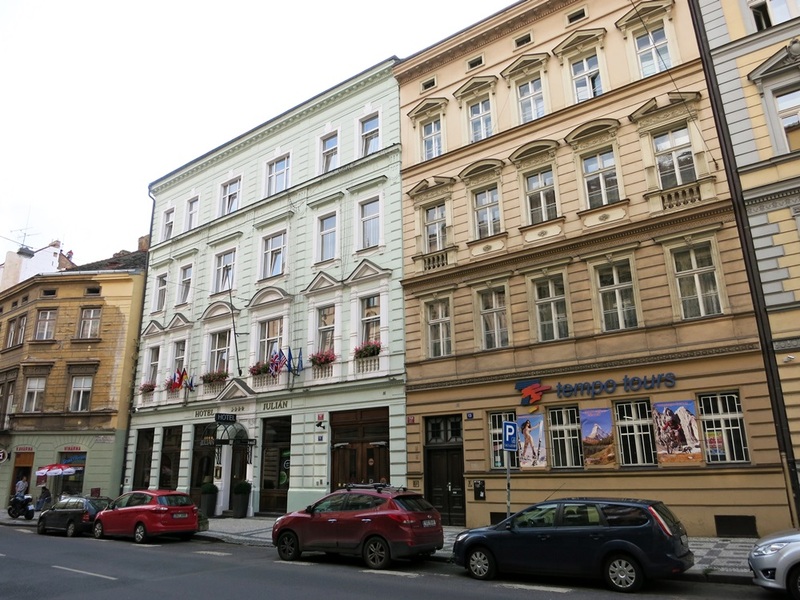 While the houses, occupied by Jews banned from living anywhere else in Prague, were built and re-built over the years, many of the area’s historic buildings thankfully escaped destruction (even Hitler decided to preserve the Jewish Quarter as a “Museum of an Extinct Race”), making them the best preserved complex of historical Jewish monuments in all of Europe. 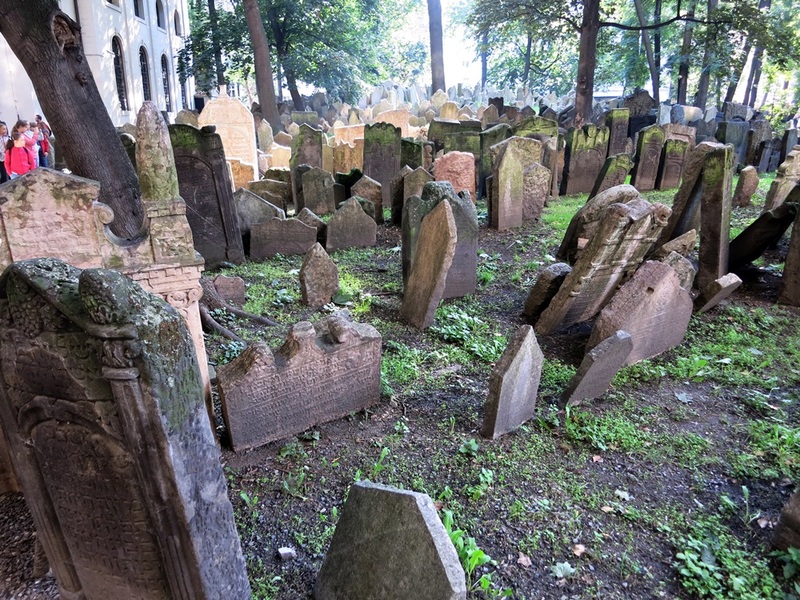 This includes 6 synagogues and the beautiful Old Jewish Cemetery, considered the most remarkable of its kind in Europe. Today the buildings and cemetery make up the Jewish Museum, and a two ticket options allow entrance into some or all of the sites. Of particular emotional note is the 1535 Pinkas Synagogue, which serves as a memorial to the Jewish victims of the Holocaust from Bohemia and Moravia (the 2 historic regions of the Czech Republic). Each of their names, nearly 80,00 in all, are inscribed on the walls in alphabetical order, so small and tidy that from far away they look like a design on the wall. The number as you walk through the rooms is staggering. Photos aren’t allowed inside, but you can see some visuals from the website here. There’s also an exhibit inside of drawings done by children in the Terezin concentration camp. The one place where photos are allowed (for a small additional cost) is the Old Jewish Cemetery. It dates back to the 15th century and some stones have bodies twelve layers deep.The final burial took place in 1787, and it’s estimated there are 200,000 bodies in the relatively small space. I’d never seen anything like it — just amazing. 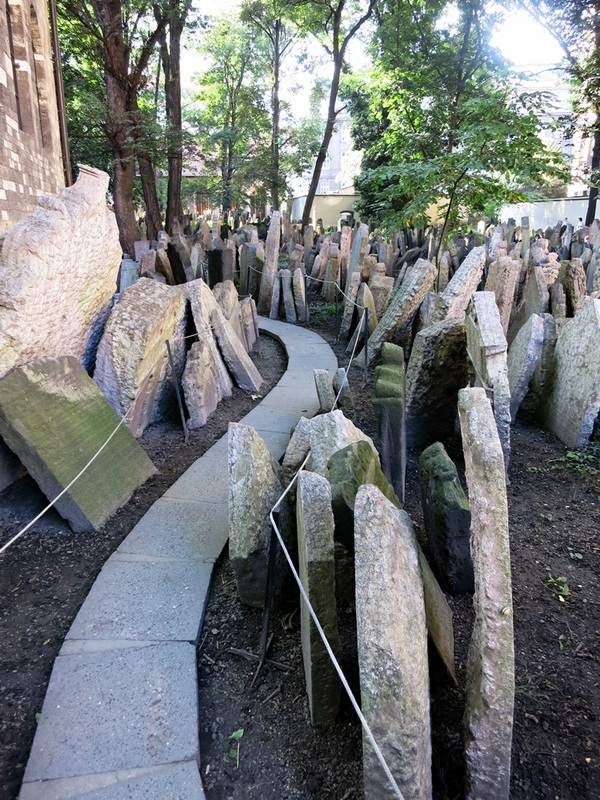 The Old Jewish Cemetery in Josefov, the Jewish Quarter of Prague. A beautiful and peaceful stroll past the approximately 12,000 tombstones. 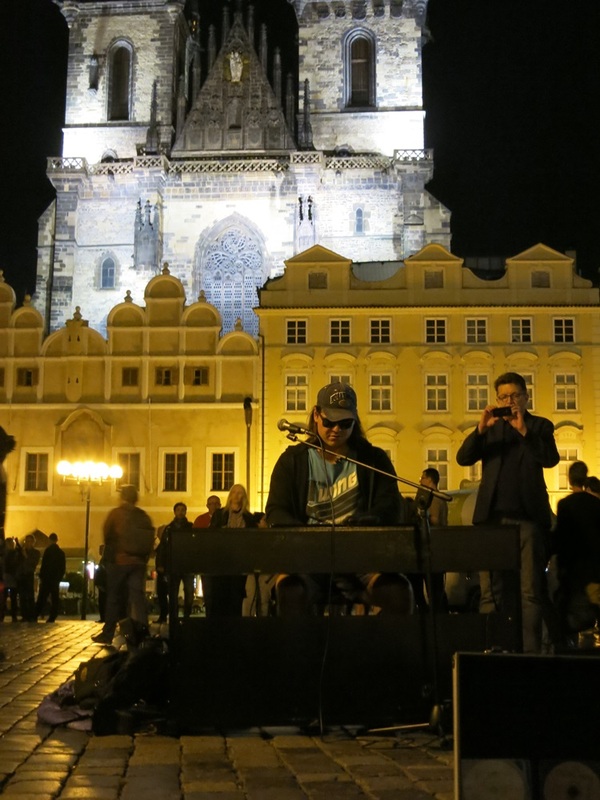 After leaving the Jewish Quarter I stopped to enjoy a song from the most wonderful busker in Poland — this man. He got all of the coins in my wallet. I just wish I knew if I gave him 20 cents or 20 dollars. I hope it was the latter. 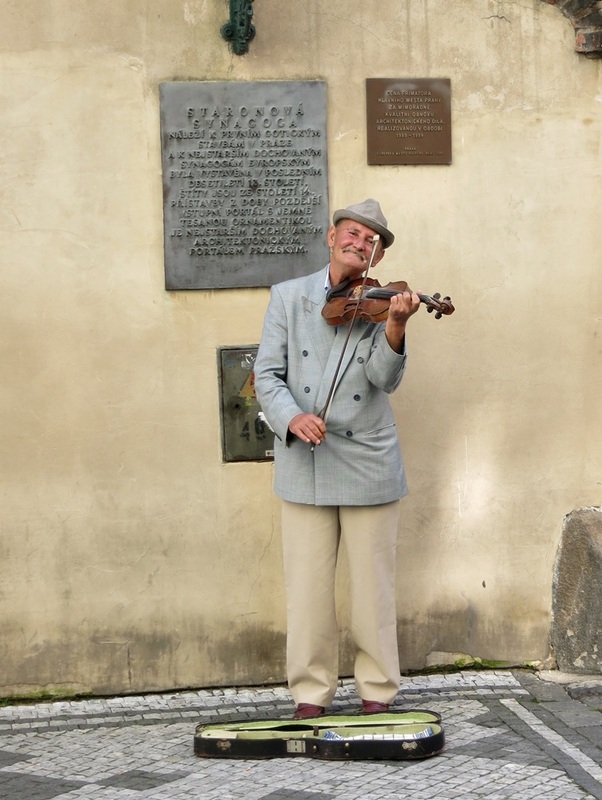 Prague’s best busker in the Jewish Quarter. At this bakery (Krusta) you didn’t get one hot off the grill — they send you inside for one that’s already been made, so it was cold. 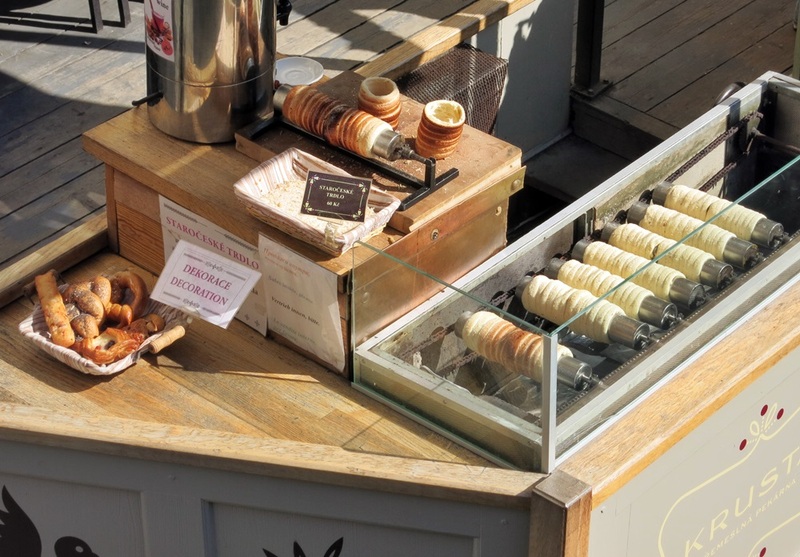 I suspect that because trdelnik is grilled rather than fried, it tastes best when it’s hot, so if you find yourself on the hunt for some, insist on a hot one. Still, even cold, it tasted like a concentrated pastry version of Cinnamon Toast Crunch cereal, which I think we can all agree is never a bad thing. 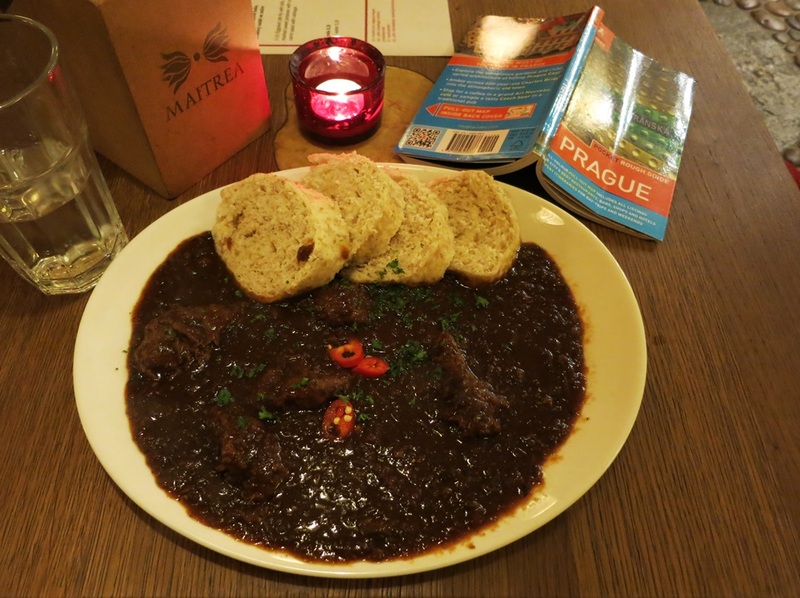 Having done a bit of dietary homework ahead of time (taking firm notes), I made sure I visited Maitrea, a vegetarian restaurant with a charming subterranean stone cellar dining room that served up a spicy meatless goulash with wholemeal dumplings (aka slices of soft bread) for the equivalent of $7. Pretty it’s not, but tasty it definitely was. The tasty vegetarian goulash at Maitrea. I also visited Cafe Savoy in the Lesser Town, because my research had identified it as the best place to sample ovocne knedliky, a traditional Czech fruit dumpling. 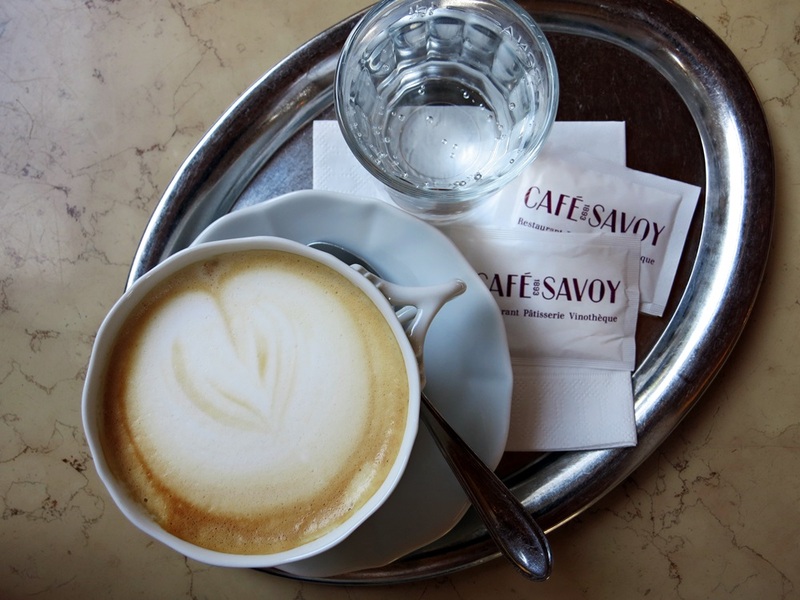 Picture perfect cappuccino at Cafe Savoy. 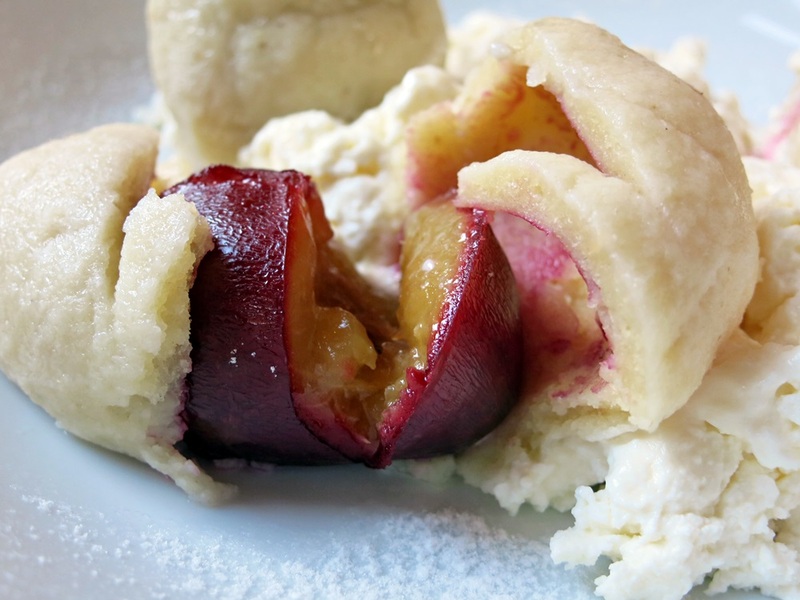 Ovocné knedlíky – fruit curd cheese dumplings at Cafe Savoy. I didn’t love them (the warm cottage cheese was totally overwhelming), but to be fair, I’d seen this photo of the dumplings before my trip and it proved to be a bit misleading. It showed strawberry dumplings, which don’t have pits, and just a sprinkle of the cheese curds on top rather than a large mound underneath, but even though I didn’t care for them, I was glad for the opportunity to try something new in a lovely setting. Plus, the cappuccino was delightful. Cheers, Prague! Until next time! Thanks for the awesome visit, Prague! Next up….a bone church and crossing into Poland! Stay tuned. Lovely! I want to visit Prague now. What a great post! Great writing. Great pictures. The busker is a prize winner!